In my state Propsition 8 will try to amend the constitution to eliminate gay marriage. It will most likely pass. I would normally use this as a launching pad into the utter stupidity of direct democracy. It is a shame that I can vote on propositions that can pass with a slim majority and have the force of a constitutional amendment. But then others might say that, of course I’d have this view against Prop 8, I’m from the only part of the state that is opposed to the measure or some other assorted ad hominem. In reality, I think that this shows how far I’ve come. When I was young, I thought you could catch “teh gay” like cooties. I was a very scared boy. Eight years ago, I shrugged my shoulders on the issue of gay marriage, thinking selfishly: that since I’m not gay this was not my battle. In fact the extra tax burden on those who are gay would mean less for me. Four years ago, I saw the issue for what it was: a blatant attempt to win the presidential election by mobilizing social conservatives to vote. At the time, I wished we’d have stopped this issue in the tracks by separating civil unions from religious marriages. I never much cared before. Now, even though I will vote on the losing side in this issue, I realize what we do to each other we do unto ourselves. I do have faith. And, thankfully, I’m learning patience. Thank you =) Very well put, as always! 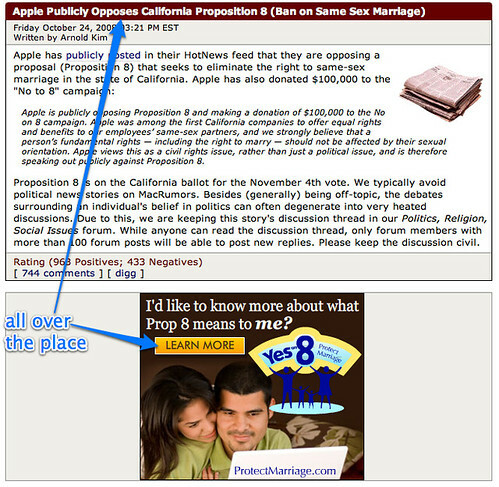 Interesting analysis on prop 8. Color me pessimist though.